It’s been a warm winter in Steelhead Alley. Instead of lots of snow, we’ve had a lot more rain this year than previous years. We’ve had 10-12 blowouts and we usually have far fewer. The precipitation raised water levels, has brought in more fish and its drawn the steelhead further into the systems than we would expect this time of year. Our runs have been smaller than in previous years. However, we are seeing larger size fish than we’re accustomed to. Normally, they are four or five pounds. This winter, on the other hand, we are seeing more six and seven pounders. I caught one this year that was probably 12 pounds, but that’s been rare. Anything bigger than eight pounds is a big fish for Erie. On a good day, and with good bait, you can expect to catch 10-15 fish in eight hours. Nonetheless, you’ll have to work for them. I’ve been walking the creeks rather than staying one spot. It’s important to focus on the deeper, slower moving holes that the fish winter in. Don’t expect to find them in the faster water. Looking at the long-term forecast they are predicting a colder February, which means the streams will probably freeze up. Nevertheless, they are fishable now, although some are starting to slush up. Shore ice is also becoming more prevalent. What does this mean for fishing in the short term? If the colder temperatures continue finding fishable water will be challenging, but hopefully there will be ice fishing opportunities in Steelhead Alley. It’s no secret to anyone that the Walnut Creek Marina will be loaded with ice anglers as soon conditions permit. For now, and this weekend, there is open water. Meanwhile, expect frozen guides as temperatures will likely be in single digits. Will the fish still bite? Absolutely. 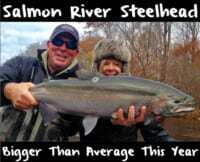 This time of year steelhead are going to be chasing eggs. I’ll be using Fire Brine eggs fished in netting. White and pink netting are best in clear water, whereas chartreuse is best in off-colored water. If it’s steelhead or brown trout eggs I’m using it takes about 15 eggs per sack, but for salmon you’ll only need about seven. I like to run four-or-six pound Berkley Vanish fluorocarbon leaders with six-pound Trilene for the main line. When it comes to hooks, with egg sacks I’ll use a size 10-12 Gamakatsu octopus or a size 12 in a Raven Specimen hook. For floats, I’ll run a 2 or 3.5-gram crystal Sheffield floats. Editor’s Note: James Swearingen is the founder of Steel City Anglers. 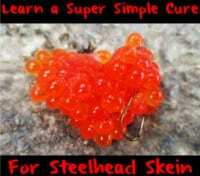 For more info please visit https://www.facebook.com/SteelCityAngler412.